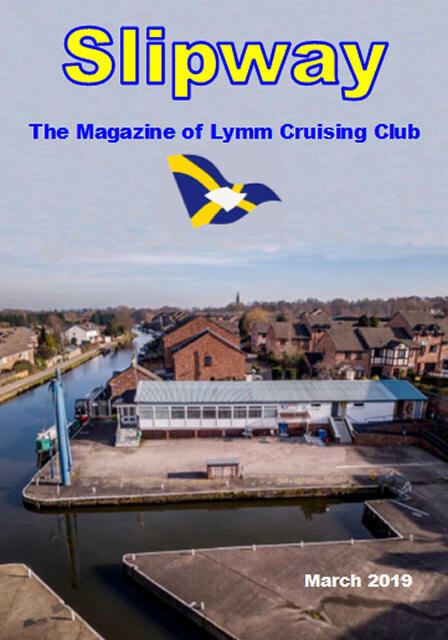 Over the 2019 Whitsun Bank Holiday Weekend at the end of May it is Lymm Cruising Club's (LCC) turn to host the annual Federation of Bridgewater Cruising Clubs (FBCC) Boat Rally. 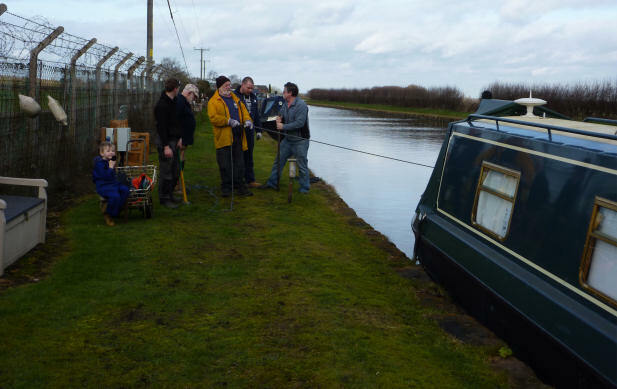 Consequently, our boating year started on the 4th January with a Rally Committee Meeting to see where the organisation of the rally was up to. I am not actively involved but Ange is Rally HQ Officer and is also organising the purchasing and printing of the cloth bags required for the "goody bags" given to attendees at the rally. Our friend Paul Savage is the Mooring Officer for the rally and is in charge of allocating the moorings plus anything else appertaining to moorings. 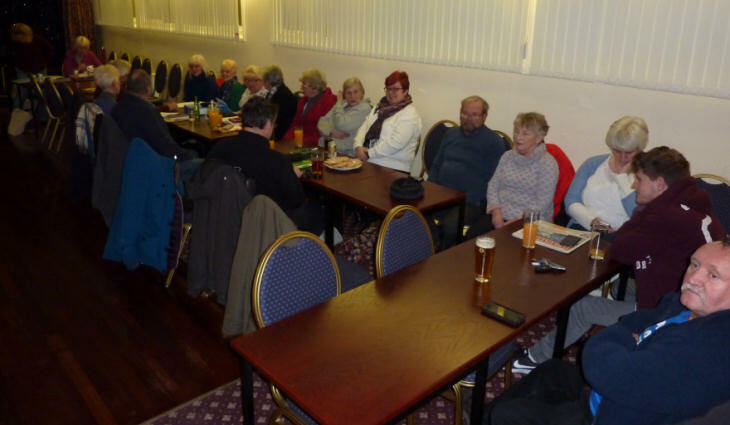 The meeting was well attended with many members giving up their time to come to LCC's clubhouse on a dark and dismal January evening. However, it was good to have a catch-up with our boating friends, many of which we had not seen for a couple of months, and we are all looking forward to the next meeting we can attend which will most probably be the Club's AGM in February. 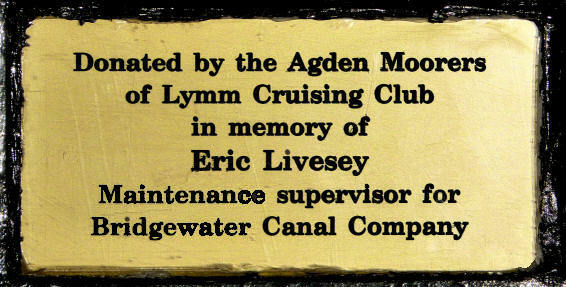 Eric Livesey was the Maintenance Supervisor for the Bridgewater Canal Company and a long-standing employee who sadly passed away in 2015. 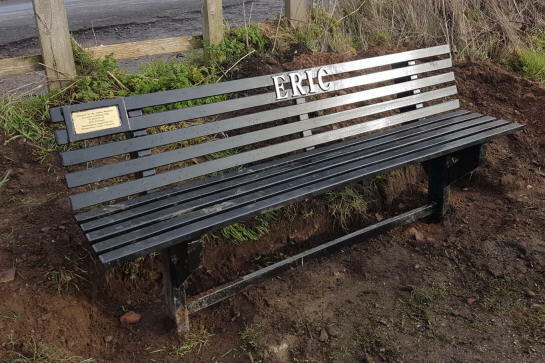 Eric was a friend of LCC and did many favours for the Club. 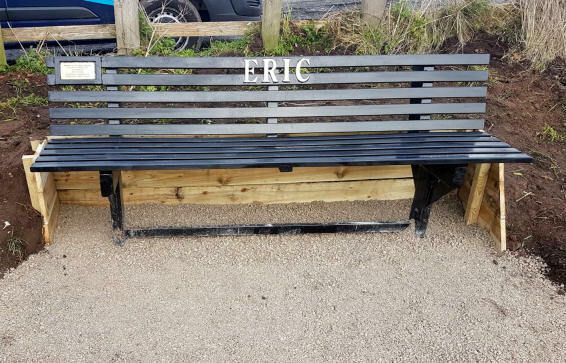 Alan Savage and his son Phil made a new bench to replace the vandalised one opposite the water point at Agden dedicated to his memory. 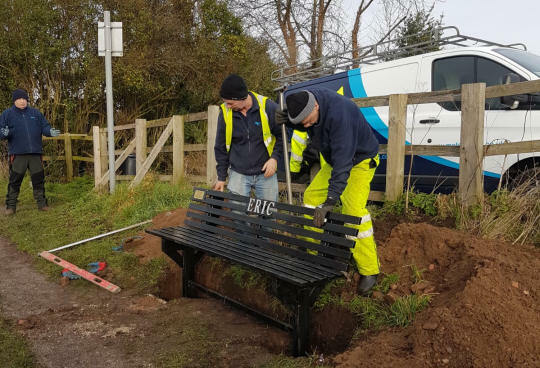 The new, beautiful steel bench was put in place by Bridgewater Canal Company's contractors supervised by Eric's son (also called Eric) on the 21st January 2019. 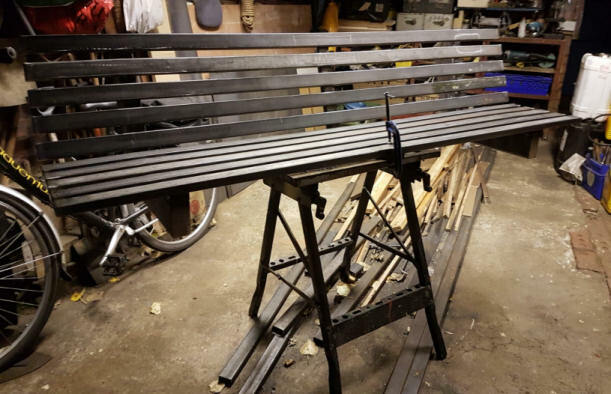 Below are a few photographs taken by Lin Savage of the bench under construction and being installed. 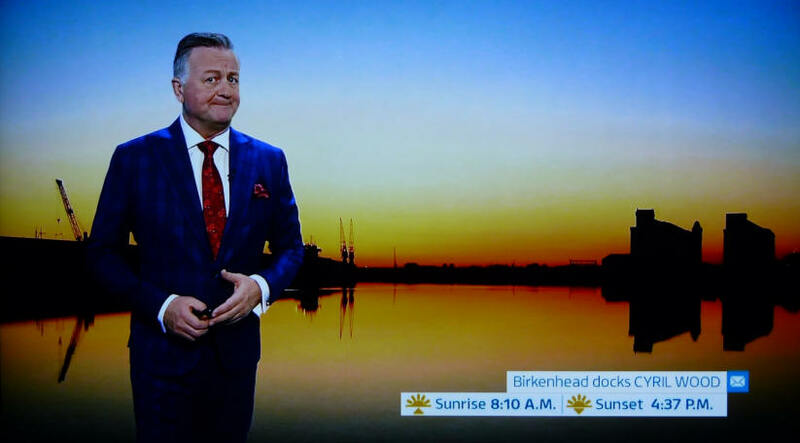 Later on in the week I had a photograph of sunset over Wallasey and Birkenhead Docks used as a weather photograph on the Granada Reports Weather Forecast. A screenshot of the Weather Forecast and the original photograph are included below for your appreciation. Late in 2018 Ange and I were asked if we would consider being nominated for Lymm CC's Committee. We both agreed and at the Club's AGM on Tuesday the 5th February 2019 I was voted back onto the Committee as Magazine and Website Editor. Ange was also voted onto the Committee as Quartermaster. No more watching Coronation Street with a cup of coffee and chocolate biscuits for us on Committee meeting nights! After the meeting it was gratifying to receive so many congratulations and positive comments. In the week following the AGM we had a further two trips up to Lymm. 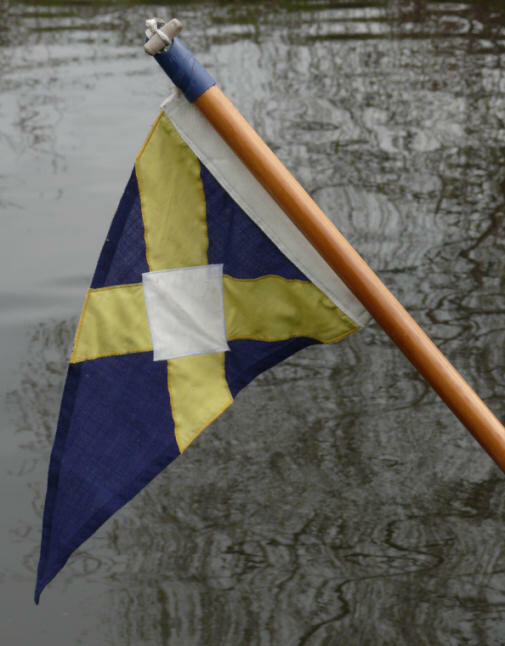 The first was on the evening of Friday the 8th February when it was a FBCC Rally Meeting after which we were given some more positive comments regarding the AGM. The first Committee Meeting after the AGM was on Monday the 11th February. Ange was away in Carnforth and had already made her apologies for not being able to attend so I went up to our mooring with Ruby straight after work on the Monday afternoon. 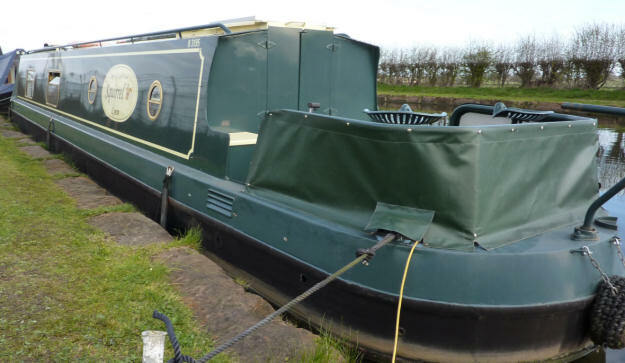 I had booked a day's holiday for the Tuesday and planned to cruise the boat down to Lymm, stay there overnight after the meeting and return the following day. 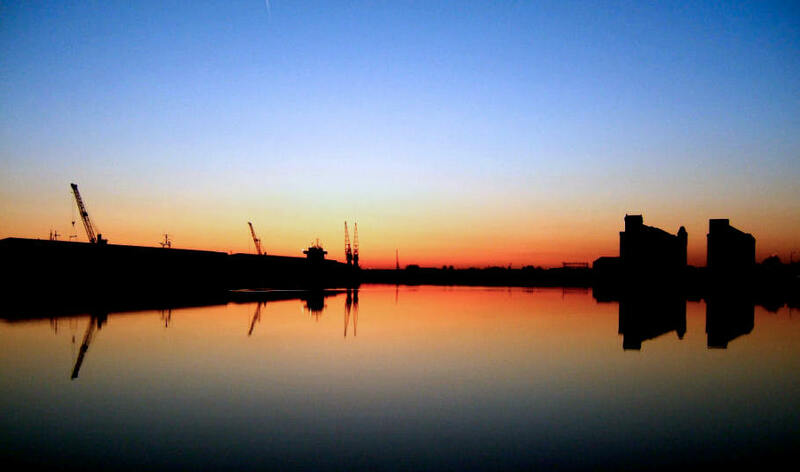 Monday afternoon was beautiful. I could actually feel heat from the sun whilst we cruised down to Lymm. As I reversed into the arm off the canal, outside the Clubhouse, Chairman Keith Moore was just getting into his car and shouted across to me... "Fancy a trip out did you? The meeting's not until next week!" He must have seen the look of disdain on my face and continued... "Only joking... see you later!" After tea I headed into the Clubhouse and chatted with other Committee members until Keith started the meeting. It was a good (if not long) meeting when we were officially told our Committee positions and also dealt with some of the many pressing matters within the Club. When the meeting concluded I returned to the boat, gave Ruby a walk around the Club Yard before falling into bed after quite a busy day. Next morning we had a lie-in and after breakfast we headed back to Agden. 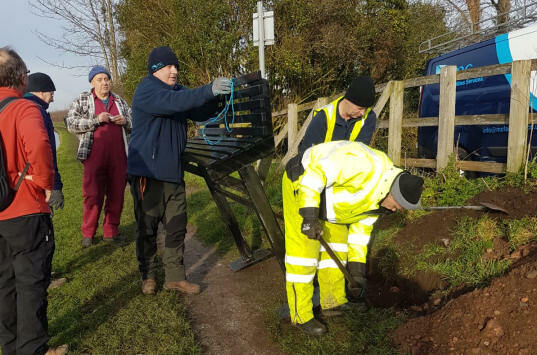 I did a few jobs before having a cuppa with our new Mooring Officer Alan Savage, after which we packed our things in the car and headed for home after our first cruise down the canal of the year and the first Committee meeting of the 2019 boating year. 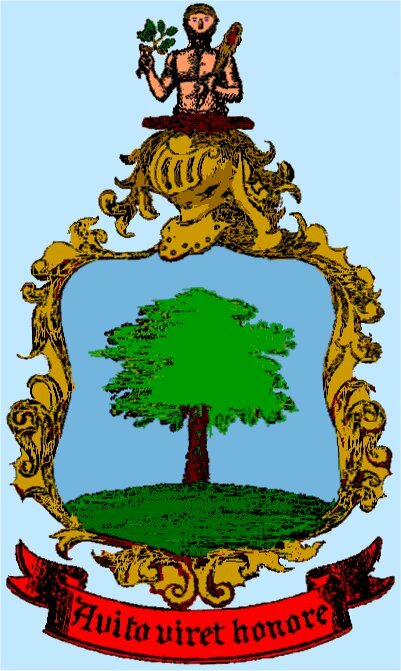 Most satisfactory! 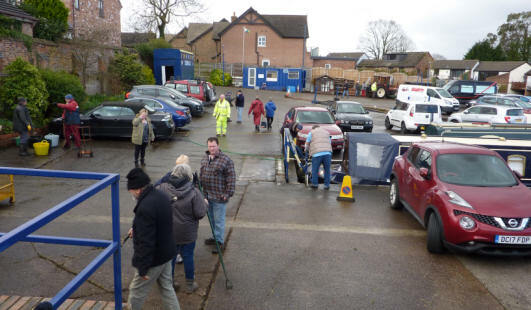 Our third visit to Lymm in a week was to the work party at our moorings on the Saturday morning. Our boat was one of the boats to be moved... admittedly only a boat's length but it was forty five feet closer to the car park. After the work party was completed we had lunch and then cruised down to Lymm by boat accompanied by Paul and Wendy on Adreva. Ange wanted to go through her Quartermaster's Cupboard and do a stock take of its contents, which she had planned to do the following morning. In the meantime, we moored in the slipway and later on, after Paul and Wendy had returned to Agden, we went out for tea with Alan and Lin Savage to the Wheatsheaf near the Agden moorings. The meal was very good as was the company! Next morning we had a bit of a lie-in and after breakfast Ange went into the Clubhouse to make a start on her cupboard. 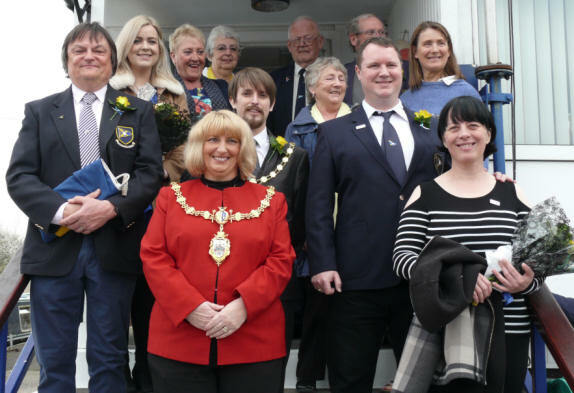 Before long she was joined by other Committee Members including the Chairman and the Treasurer preparing for receiving mooring and Club fees from the members that afternoon. Whilst Ange continued with her tasks Ruby and I took the boat back to Agden and returned for Ange by car a little later on before heading for home. I had asked the Committee Members to let me have their reports for the magazine by the 20th. Most of the reports did reach me by then but there were a couple who took things up to the wire (you know who you are). I had kept most of my templates for the magazine from when I was editor previously. Even so, I was busy for the next few days performing the juggling act (more like a Rubik's Cube puzzle) of making the most of the available space. One concern was the front cover but when Chairman Keith Moore sent me some photographs of the Clubhouse and Yard taken by Norman Pimlot from a drone I just couldn't resist using one of them for the front cover. I had to perform some "gardening" in Photoshop to remove an unfortunately placed van and add height to the sky but I was pleased with the end result which is included below. Needless to say, I was relieved when the printer (InPrint - Wallasey) e-mailed me to inform me that the printed copies of the magazine were ready for collection! With the magazine now "put to bed" I can now concentrate on up-dating the Club's website - https://lymm-cc.co.uk. 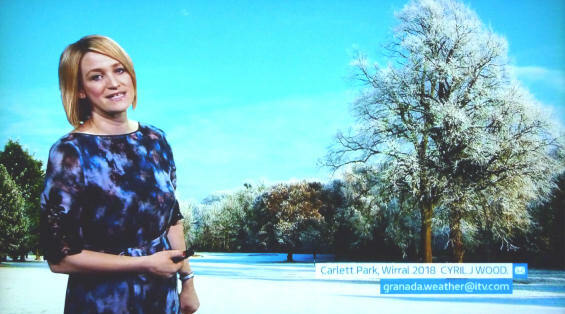 Later on that week I was thinking that I hadn't had many weather photographs shown on the Granada Reports Weather Forecast. 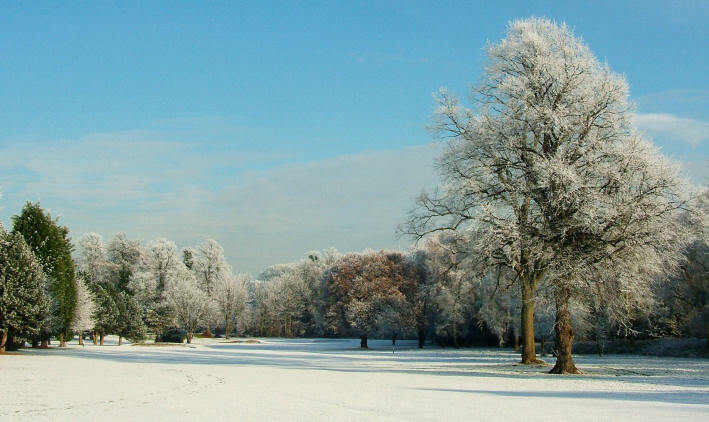 As if by magic... the weather forecaster was comparing this year's weather with last year's and one of the photographs they used to illustrate the weather this time last year was my Carlett Park in the Snow photograph. I have included a screenshot of the weather forecast and the original photograph as well. The first weekend in March Ange had arranged to go with Pail and Wendy accompanied by Shannon and Paul and Wendy's niece and nephew to Reaseheath College for the Lambing Experience Day. We arrived at Agden mid-morning and whilst the others went to Reaseheath I decided to stay at Agden and make a start on my "To Do" list. Alan and Phil Savage were doing a welding job on Paul's boat so I started off by fitting new window catch screws to the lounge windows. 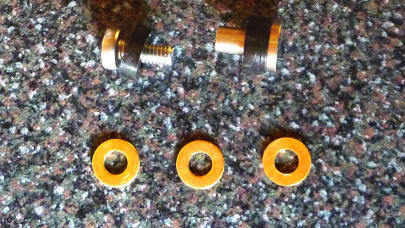 I had obtained the replacement screws from Caldwell's Windows and had sufficient to replace all the loose screws. Having previously tried to replace some of the screws I had difficulty obtaining the same amount of friction on the catches as when they were new. This time I experimented by adding thin brass washers to the assembly and when satisfied, I ran cyanoacrylate adhesive (Superglue) into the threads to ensure that they retained the friction setting and didn't come unscrewed. This took me up to lunchtime and after I had my lunch with Alan and Phil I brought the boat up to the water point and started to fill the boat's fresh water tank. Once the water had been running for a few minutes I closed all the taps that I had left open and turned the water pump on. Once the system pressurised I removed the airlocks from the system then checked all the pipe work for leaks. Satisfied that everything was in order I continued filling the water tank which took well over half an hour then returned the boat back to its mooring. When the others returned we all had a cuppa whilst they shared tails of breach births, placentas, etc (lovely). before Paul and Wendy left and we had our tea. Afterwards we watched a film before going to bed in a nice, warm, cosy boat. The next morning was wet, drizzly and miserable and after a lie-in we had breakfast, cleaned and tidied the boat before setting off for home after an enjoyable and fulfilling weekend. Our next trip to Lymm was the following Tuesday the 5th March for the monthly Club meeting. I had lost my voice and did not anticipate returning to work for the rest of the week. 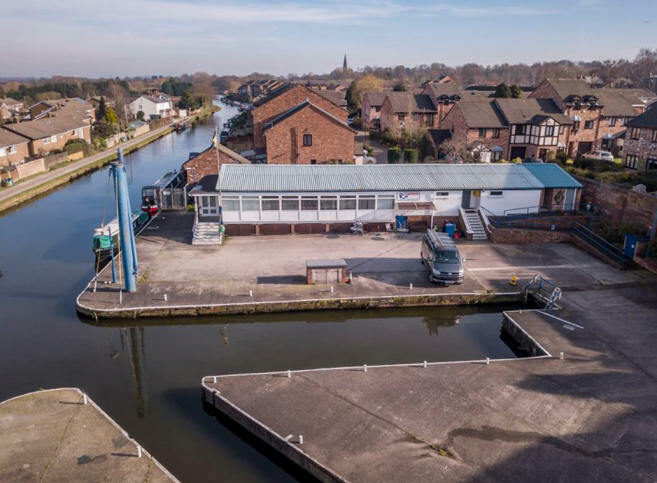 This allowed me to take the boat down to Lymm and asked the Harbourmaster if it would be in order to leave the boat there until the weekend. With permission granted, I moored the boat in the arm outside the Clubhouse. 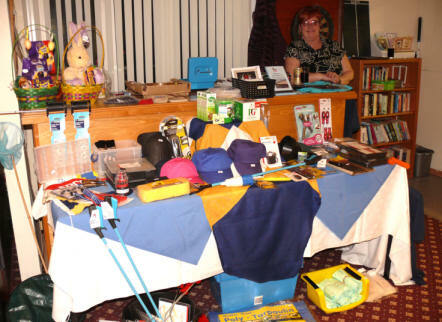 It was the first meeting that Ange had her Quartermaster's Table out which was filled with all kinds of goodies for sale ranging from paint rollers to clothing with the Club logo on them. She had worked hard ordering and buying items and her hard work paid off as the sales were better than expected and she received many positive comments from Club and Committee members alike. That weekend there was another work party but this time it was at the Clubhouse clearing, cleaning and preparing the Clubhouse Yard for the Opening Cruise. We arrived at the boat Friday afternoon and took the boat down to Lymm so that we were ready for the work party. I have never seen so many people at a work party. It was attended by forty one members including two junior members who also got stuck-in. 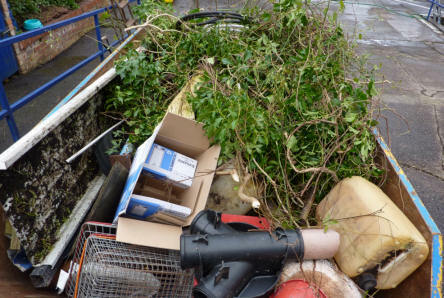 There was a really good atmosphere with plenty of banter whilst throwing out enough rubbish to completely fill a large skip. Bacon butties were laid on at lunchtime and even though the work party had officially finished many members carried on working throughout the afternoon. There was also an FBCC Rally Meeting in the afternoon that was also well attended. We had brought the slow cooker with us from home which had been merrily bubbling away all day. The resulting stew we had for tea and it was most enjoyable. We relaxed for the rest of the evening watching TV and had an early night. After a lie-in the next morning we cleaned and tidied the boat before returning it to its mooring at Agden and headed for home after a tiring but rewarding weekend. 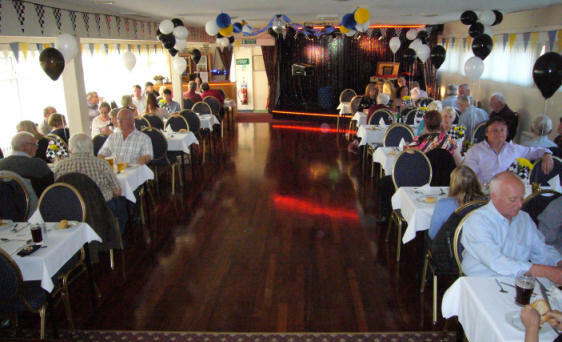 The following weekend was the first social event of the Lymm CC cruising year. We decided not to take the boat down to Lymm due to high winds and when we arrived at Agden the water level was the highest that I had ever seen it. This was most probably due to the high rainfall that we had experienced plus Barton Swing Aqueduct being closed and the excess water not being run-off. After a chilled-out afternoon we drove down to the Lymm CC Clubhouse and changed into our fancy dress outfits. Ange was dressed as a hippy and I went as Mr Spock from Star trek. We also took part in Mister and Misses. The evening was well supported and afterwards we returned to the boat after a most enjoyable evening. After a lie-in and breakfast we dodged the hail stones to the car park and left for home. 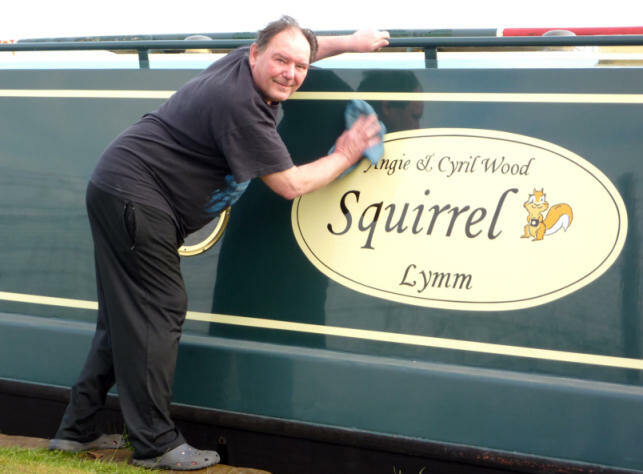 The start of Lymm CC's Cruising Season was drawing near and on the last weekend in March I spent a weekend cleaning and polishing the boat's paintwork. Ange had a busy weekend ahead with work and family commitments so Ruby and I headed up straight after I finished work on the Friday. Fortunately, the weather forecast was good and I looked forard to completing the jobs that I had set mayself. After saying hello and sharing a cup of coffee with Alan Savage I started off my cleaning regime by power-washing the boat's cabin sides with the Kärcher and leathered it off which took me nicely up to tea time. Next morning, after breakfast I T-Cutted the port-side and polished it with two applications of Autoglym Resin Polish with Carnauba wax. After lunch I turned the boat around and repeated the process on the starboard side. I only did the cabin sides and didn't bother with the gunwales as this would be easier to accomplish (without bending down) when the boat comes out of the water for its biannual hull cleaning and blacking scheduled for the beginning of May. By tea-time I was tired and decided to call it a day. The following morning... Sunday, after putting the cleaning equipment away and tidying up, I took the boat down to Lymm to empty the toilet and top-up the water tank. It was a beautiful Spring morning with the sun shining on the blossom that was starting to bloom on the trees lining the canal. The Clubhouse Yard was looking spick and span ready for the following weekend's Opening Cruise. 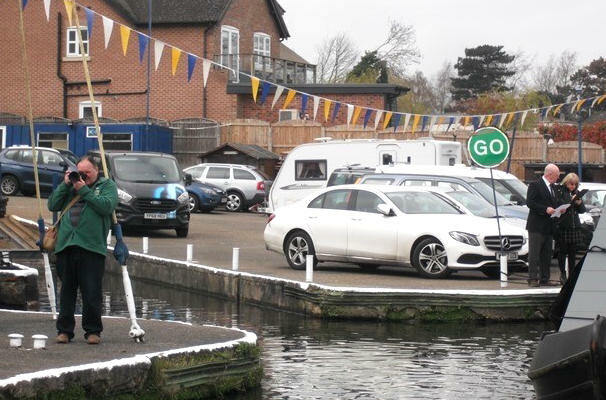 After completing my tasks and chatting to fellow Club members I retraced my steps (or should it be wake) back to Agden where I moored at the car park, loaded up the car and headed for home after returning the boat to its mooring after a most productive few days (and it didn't rain). The following Tuesday was the Monthly Lymm CC Meeting. We came up early in order to move the boat down to the arm outside the Clubhouse (with the Harbourmaster's permission) in preparation for the next weekend which was to be a busy one... we were due to attend an FBCC Rally Meeting on Friday evening, Saturday evening was the Opening Cruise Social followed, on Sunday, by the Opening Cruise with a Lymm CC Committee Meeting on the Monday... phew! I moored the boat alongside Brian Burns' boat so that it would not be in the way of the boat on the trolley being slipped back in the water or anyone wanting to use the water point or pump-out facilities. We arrived at Lymm on Friday evening in good time for the FBCC Rally meeting and afterwards fell into bed... it was a good move to leave the boat at Lymm! Saturday promised to be a sunny day and I managed to finish a couple of jobs. The Opening Cruise Social was well attended and we were treated to good food, good company and good entertainment... what more could you ask for? Sunday dawned a little overcast but at least it was dry. 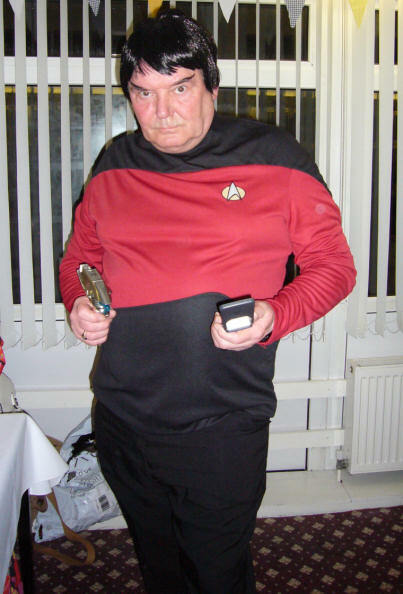 Ange was serving sherries to the members as they arrived at the Clubhouse and I was on photographic duties. A couple of the guests were late which delayed the proceedings but before long the boats were following the Commodore in a procession to Grappenhall. 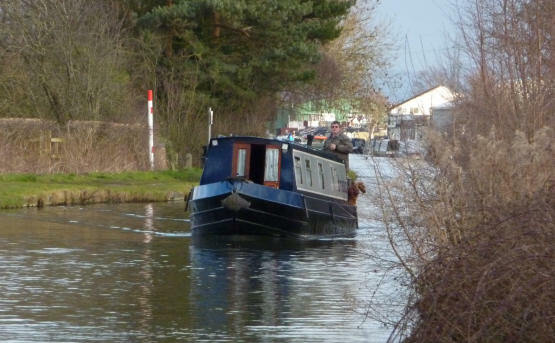 We were one of the last boats to leave but, after a slow cruise we moored just after the A55 road bridge next to our friends Wendy and Paul on Adreva. They had dressed their boat with bunting, pennants, etc. and most definitely are in with a good chance to win the Roy Cocken Shield awarded to the Best Turned Out Boat on the Opening Cruise. After lunch we set off back to Lymm, turning around at Grappenhall Turn. 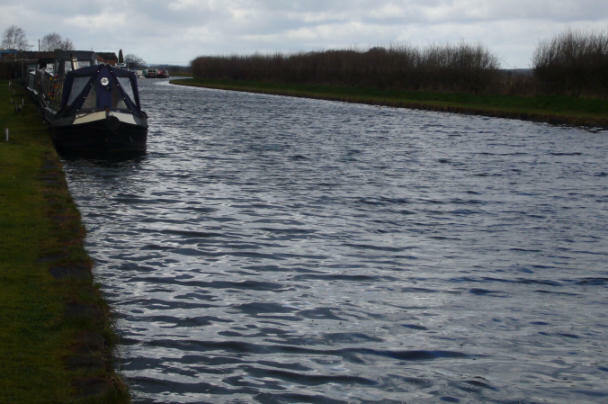 We had a leisurely cruise back to the Clubhouse but when we came to moor there whilst manoeuvring the boat's gearbox would not go into neutral or forward gear. I suspected that the gearbox control cable had snapped... a suspicion that was confirmed when, after performing a half-pirouette, we eventually managed to moor. Paul came to the rescue with a replacement cable which, after fitting, worked well but was in need of adjustment as only tick-over was available in reverse... a job for another day I think! 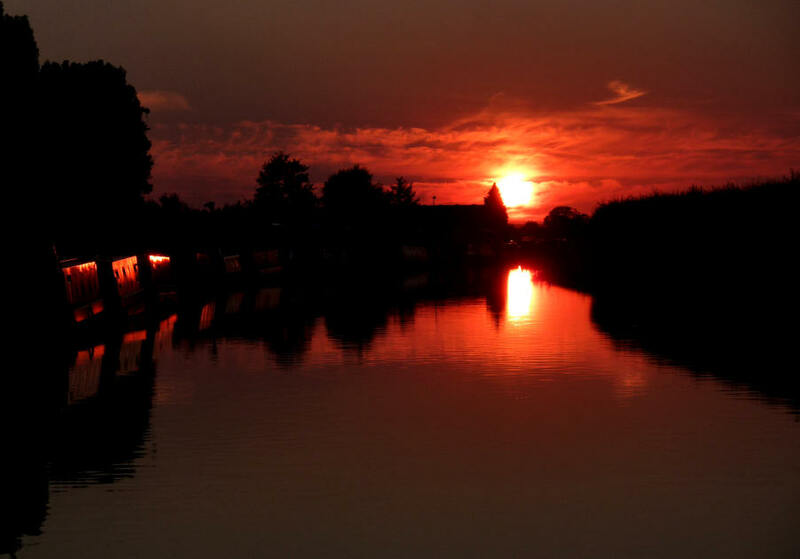 For our 2018 Summer Cruise we had originally planned to revisit the Llangollen and Montgomery Canals accompanied by Paul and Wendy Savage on their narrowboat Adreva. 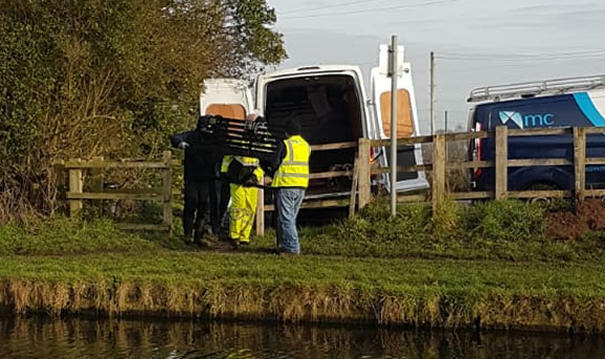 Unfortunately, we were unable to fulfil this plan due to the breach on the Shropshire Union Canal’s Middlewich Branch below Stanthorne Lock. 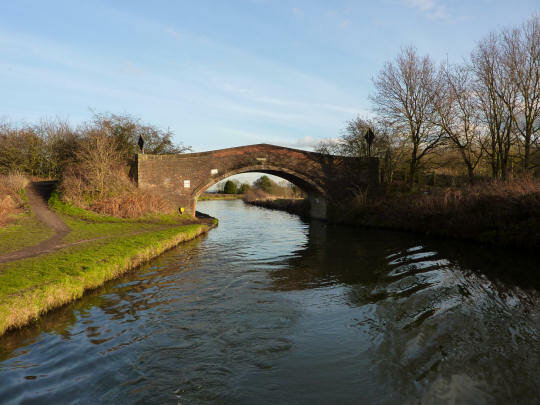 For our 2019 Summer Cruise we planned to try again for the Llangollen and Montgomery Canals. With the success of taking our summer holidays early the previous year (end of June to be beginning of July) we planned to take the same two weeks… Saturday the 22nd June to Sunday the 7th June 2019. 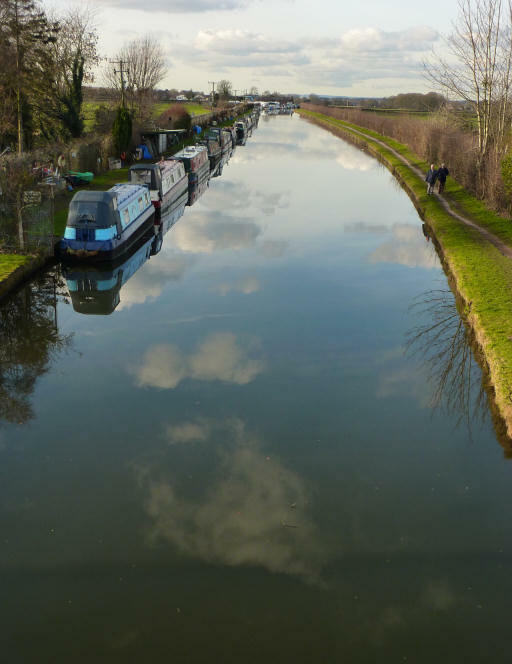 Accordingly, the bookings to descend Frankton Locks onto the Montgomery Canal were made in February to avoid disappointment (fingers crossed). 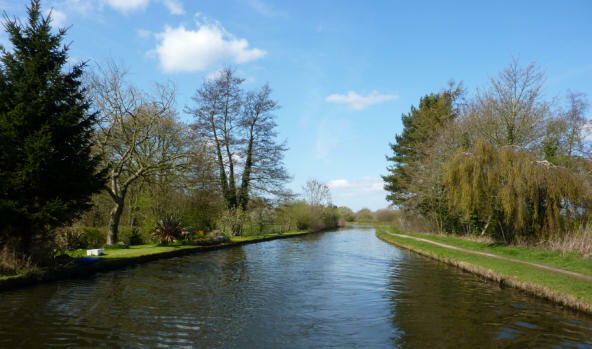 Since our last visit to the Montgomery Canal in 2005, the navigable section connected to the main line of the Llangollen Canal has been extended considerably to Maesbury but not as far as the restored but un-connected Welshpool Section. Accordingly, we were all looking forward to cruising yet another section of canal that we had not previously been on. Finances, health, and time allowing!